Rise of the Tomb Raider: 20 Year Celebration includes the critically acclaimed Rise of the Tomb Raider, nominated for over 75 “Best Of” awards, in which Lara Croft becomes more than a survivor as she embarks on her first Tomb Raiding expedition to the most treacherous and remote regions of Siberia. 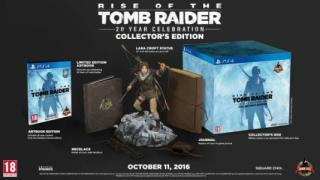 Rise of the Tomb Raider: 20 Year Celebration also includes the new “Blood Ties” single player content, VR support, new Co-Op play for Endurance mode, “Ultimate Survivor” difficulty mode for the main campaign, 20 Year Celebration outfit and gun, and 5 classic Lara skins. Also includes all previously released Downloadable Content including: Baba Yaga: The Temple of the Witch, Endurance Mode, Cold Darkness Awakened, 12 outfits, 7 weapons, and 35 expedition cards. With over 50 hours of gameplay, this is the most comprehensive version of the award-winning experience. 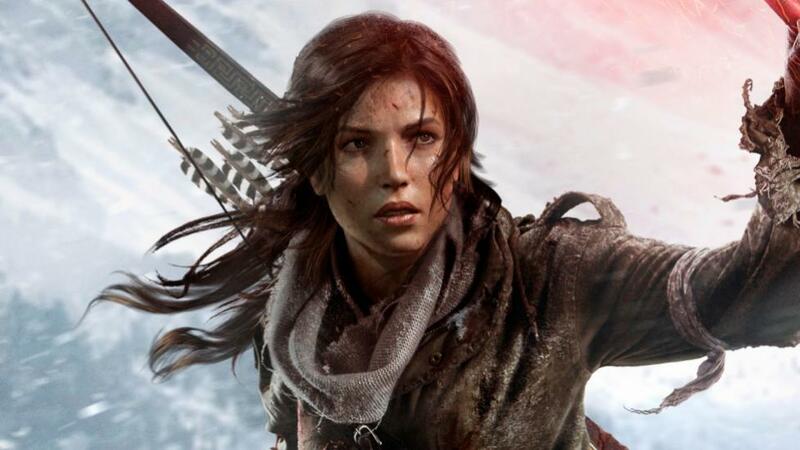 Key Features The Critically Acclaimed Action Adventure – In Rise of the Tomb Raider, Lara uncovers an ancient mystery that places her in the cross-hairs of a ruthless organization known as Trinity. As she races to find the secret before Trinity, the trail leads to a myth about the Lost City of Kitezh. 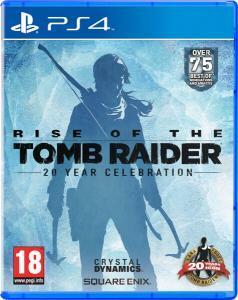 Lara knows she must reach the Lost City and its hidden secrets before Trinity as she sets out for Siberia on her first Tomb Raiding expedition. NEW “Blood Ties” Single Player Story – In the wake of her father’s death, Lara’s uncle challenges her ownership of Croft Manor. Lara is determined to reclaim her legacy and prove that she is the rightful heir, but to do that she will need to confront her past head on. Explore Lara’s childhood home in an hour of new Story Mode gameplay, and uncover a family mystery that will change her life forever. This new mode is playable in standard third person and can also be experienced in Virtual Reality mode. NEW “Blood Ties” Nightmare - Lara’s worst nightmares come alive as hordes of the undead overrun her childhood home. Defeat hordes of infectious zombies to become the ultimate zombie slayer, before the nightmare overwhelms you! Compete with friends and create community challenges with card modifiers in an all new Nightmare Mode. NEW Endurance Mode Co-Op: You and a friend must scrounge, scavenge and craft to survive the harsh elements by day, as well as lethal threats from enemies, both man and beast, by night. This is the ultimate test to see how long you and a friend can survive the sprawling, unforgiving landscapes. Fire takes fuel, cold kills the unprepared, food restores health, and everything must be caught, collected, or crafted. You start with nothing and must find everything. Work together and challenge others to your longest survival run and battle to the top of the leaderboards. NEW 20 Year Celebration Content - Five classic Lara Croft skins as well as a reimagined outfit that pays tribute to Lara’s trip to Antarctica in Tomb Raider III. New content also includes the “Extreme Survivor” difficulty setting in Rise of the Tomb Raider that will severely limit your save points, crafting materials, resources, ammunition, and health – only the most resourceful and capable will survive this new extreme difficulty. Includes all DLC – Includes all downloadable content that will extend your single-player campaign and will allow you to compete with friends. Three major releases will challenge you to survive the extreme conditions of Endurance Mode, explore a new tomb that houses an ancient terror in Baba Yaga: The Temple of the Witch, and combat waves of infected predators in Cold Darkness Awakened. In addition, new outfits, weapons, and Expedition Cards will keep you customizing, expanding, and challenging your friends to new adventures. 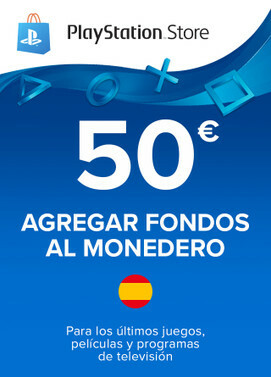 - Todo el contenido del Season pass de Rise of the Tomb Raider, el cual incluye Baba Yaga: Temple of the Witch, Cold Darkness Awakened, y todos los trajes DLC, armas y Tarjetas de expedición.